Inspired by the special exhibition New Ground: The Southwest of Maria Martinez and Laura Gilpin, we are celebrating famous artist friendships. Did you know that Leonora Carrington (1917–2011) and Remedios Varo (1908–1963) met in Paris and became close friends after finding refuge in Mexico City? Both Leonora Carrington and Remedios Varo painted primarily in a Surrealist style, infusing their works with mysticism and otherworldly elements. NMWA owns five works by Carrington, including one print, two paintings, and two sculptures. 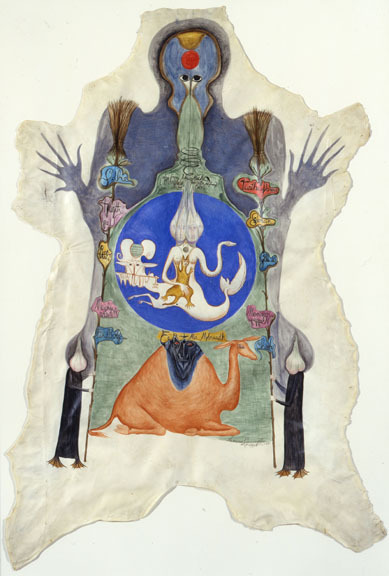 Although Carrington did not begin producing sculptures until 1990, The Ship of Cranes (2010) is exemplary of Carrington’s interest in mythology and use of animal symbolism. One of the three paintings by Varo in the collection, La Llamada (The Call) (1961), is on view on the mezzanine level. La Llamada (The Call) provides viewers with signature traits of Varo’s work, including an ethereal being dressed in gold against a darker, castle-like background. In Carrington’s book The Healing Trumpet, she modeled the two main characters after much older versions of herself and Varo, revealing how important she felt the friendship was to her and her wish that it would last well into their old age. Varo also included their friendship in stories she wrote, creating characters just as outlandish as Carrington’s. Inspired by the special exhibition New Ground: The Southwest of Maria Martinez and Laura Gilpin, we are celebrating famous artist friendships. Did you know that Lola Álvarez Bravo (1903–1993) and Frida Kahlo (1907–1954) became friends through the same social circles in Mexico? One of Mexico’s first women photographers, Lola Álvarez Bravo’s works are celebrated for documenting daily life in post-revolutionary Mexico. 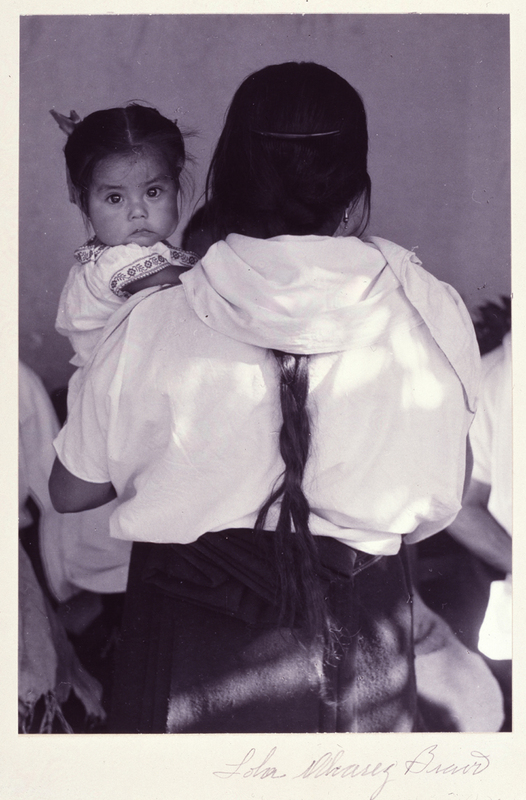 Álvarez Bravo said, “If my photographs have any value, it’s because they show a Mexico that no longer exists.” Her work in NMWA’s collection, De generación en generación (1950), expresses a strong sense of Mexican nationalist pride combined with universal human emotions. Frida Kahlo is renowned for her poignant, often shocking, self-portraits. Although she is referred to as a Surrealist, Kahlo maintained, “I never painted dreams. I painted my own reality.” Remembered for her tragic life story and her turbulent marriage to famed muralist Diego Rivera, Kahlo was foremost a fierce painter and political activist. 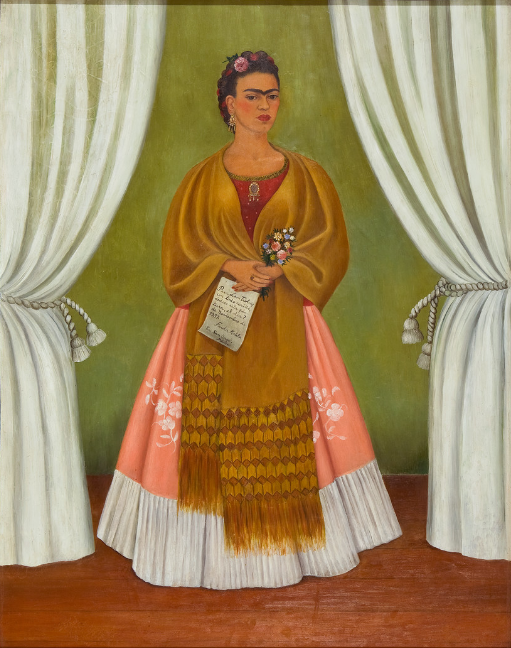 Her work in NMWA’s collection, Self-Portrait Dedicated to Leon Trotsky (1937), is one of Kahlo’s softer self-portraits, meant to commemorate her brief affair with the Russian revolutionary Trotsky. Álvarez Bravo started taking her own photographs after serving as an assistant to her husband, photographer Manuel Álvarez Bravo. After their divorce, she began her own successful, independent career. It was also through her husband that she met Kahlo. 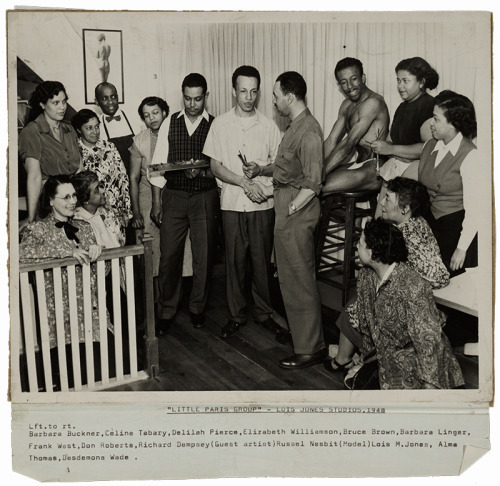 Both artists were involved in the same social circles in Mexico and shared similar nationalistic outlooks that influenced their respective artistic practices. Álvarez Bravo’s most well-known photos featuring Kahlo are often praised for their honesty and intimacy. Kahlo even fastened one of these portraits to the front of her diary, indicating the respect that she had for the photographer. In addition to capturing numerous portraits of Kahlo, Álvarez Bravo also directed a film starring the painter, but it was never completed because of Kahlo’s declining health. Álvarez Bravo hosted Kahlo’s first solo exhibition in Mexico at her own gallery, shortly before Kahlo’s untimely death. —Madeline Barnes is the spring 2017 digital engagement intern at the National Museum of Women in the Arts. Inspired by the special exhibition New Ground: The Southwest of Maria Martinez and Laura Gilpin, we are celebrating famous artist friendships. Did you know that photographer Louise Dahl-Wolfe (1895–1989) and model Mary Jane Russell (1926–2003) developed a close friendship after collaborating on photo shoots for years? Renowned for her work with Harper’s Bazaar, Louise Dahl-Wolfe revolutionized the fashion industry by arranging models outdoors or in front of interesting backdrops that rivaled the clothes they were wearing. Dahl-Wolfe spent 22 years working in the fashion world before retiring from the magazine in 1958. 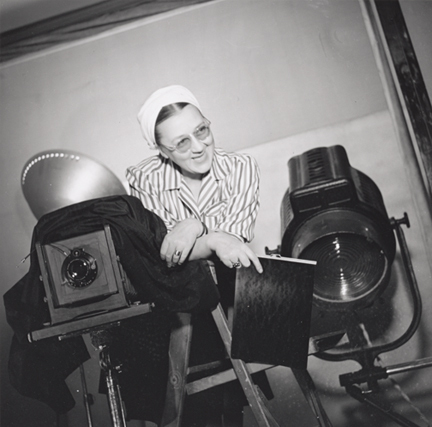 NMWA’s collection contains more than 100 photographs by Dahl-Wolfe, including five works that feature Mary Jane Russell. Mary Jane Russell signed as a model with the Ford Agency in 1948, just in time for the debut of the “New Look.” She was a favorite model of many photographers, including Dahl-Wolfe. 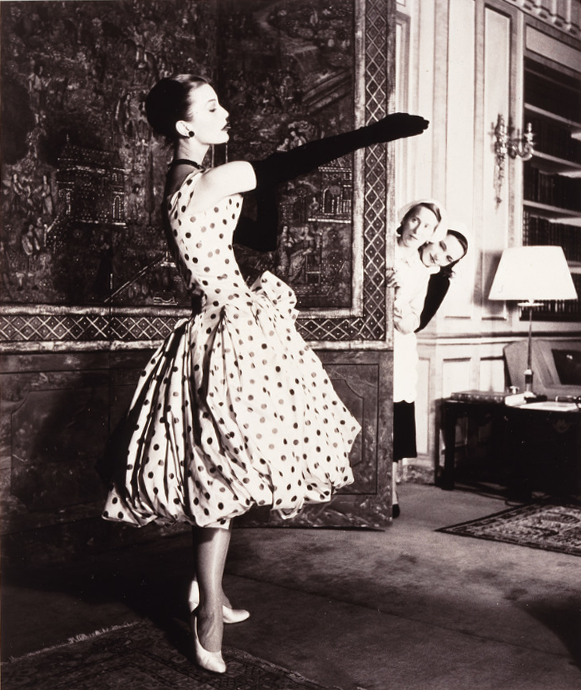 One of Dahl-Wolfe’s photographs in NMWA’s collection, Mary Jane Russell in Dior Dress, Paris (1950), features Russell posing in profile and elongating her neck, while putting on elegant evening gloves. Dahl-Wolfe placed Russell in front of a luxurious background that challenges the dress, while the contrast between the two directs the viewer’s eye directly to the dress and Russell. After meeting on a set, Russell quickly became one of Dahl-Wolfe’s favorite models. Dahl-Wolfe’s eccentric techniques coupled with Russell’s short stature and elongated neck resulted in unconventional photographs that brought personality and life to fashion advertisements. Dahl-Wolfe valued Russell’s input on shoots, making the photographs a joint effort. “Louise was a benevolent dictator, except with Mary Jane. She’d let Mary Jane say, ‘I think the dress would show better this way’” Russell’s husband, Edward, recalled. The photographer even broke an unwritten industry rule not to photograph the same model for more than two collections after trying unsuccessfully to find a suitable replacement for Russell. Dahl-Wolfe later said, “I hated the popular look of models in those days. I called it the ‘Candy Box’ look—all translucent white skin, blonde hair, and blue eyes. I liked yellowish skin and green eyes, and I found it with Betty Bacall, and above all with Mary Jane Russell, who was marvelous.” By the end of her career, an estimated 30 percent of Dahl-Wolfe’s photos featured Russell.